YouTube was supporting only the standard 16:9 aspect ratio videos for the long time. Since many people are recording videos using their mobile phones, many videos won't fit into this aspect ratio. So, YouTube used to show black bars on both sides of the video when showing vertical videos. Recently YouTube has started supporting vertical videos also. In mobile phones the vertical videos can be viewed in full screen. For testing this Vertical video format, I had uploaded a vertical video which was taken by my mobile phone. By saying "vertical Video" I mean the video size of 720 x 1280 instead of usual 1280x 720. The vertical video is looking better in mobile phone. 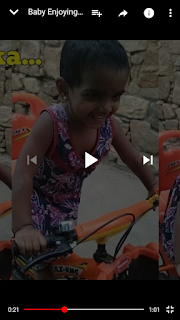 And in desktop, YouTube is showing white bars on both sides of the video. What is your opinion about Vertical Videos? Do you like Vertical Videos?